While writing my thesis on the Recent Indian period I had to read all the material I could find on that period of Newfoundland and Labrador’s past. 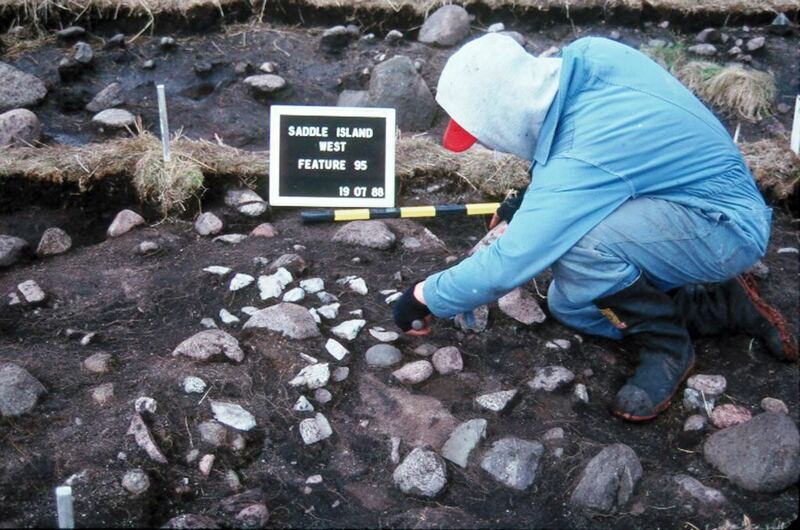 That’s when I learned about the Recent Indian site on Saddle Island, Red Bay. I told you before about the various groups of people who had occupied Saddle Island in the past including the Maritime Archaic Indians, early & late Palaeoeskimos, Recent Indians, Thule/Inuit and various European groups including Basque whalers and later European fisherman. While the Recent Indian site on the Island was carefully excavated, results of those excavations were not as thoroughly documented in published and unpublished references. The site was discovered and excavated in the mid-late 1980s and had at least 170 cobble hearths which contained fire-cracked rocks, charcoal and calcined bone. 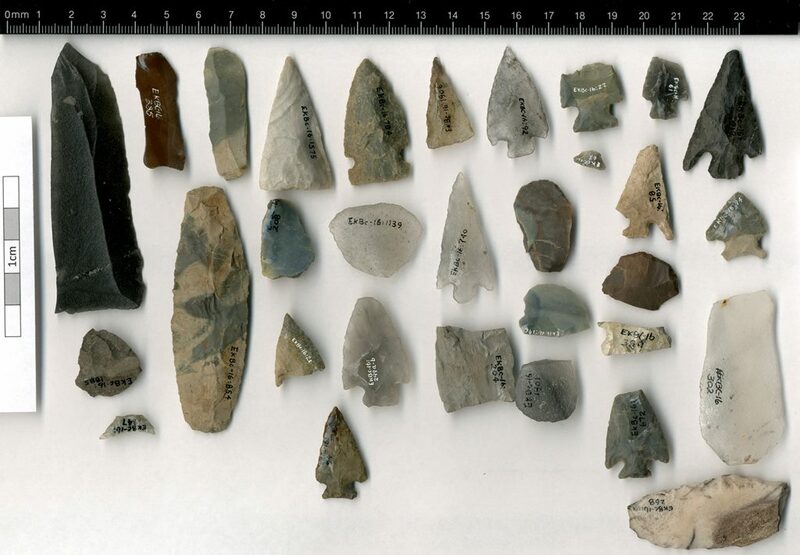 Associated with many of the hearths was a typical Recent Indian tool kit including projectile points, small bifaces, scrapers, knives and flakes from the manufacture of these tools. These artifacts were made from Ramah chert and various cherts from the Island of Newfoundland, including Port au Port, Cow Head and elsewhere. There were also several pieces of Native made pottery vessels which are unusual artifacts for Newfoundland and Labrador. The pottery was poorly fired and tempered with coarse grit and decorated with cord-wrapped paddle edge impressions. Some of the hearths also had Basque roofing tiles, burned European hardwoods and iron nails. Those items may indicate Recent Indian-European contact or that the Recent Indians scavenged the European portion of the site. Whether the two peoples ever had face-to-face contact is not indicated by the archaeological evidence. The Recent Indian period in the province falls in the range of ~2000 years ago to European contact. 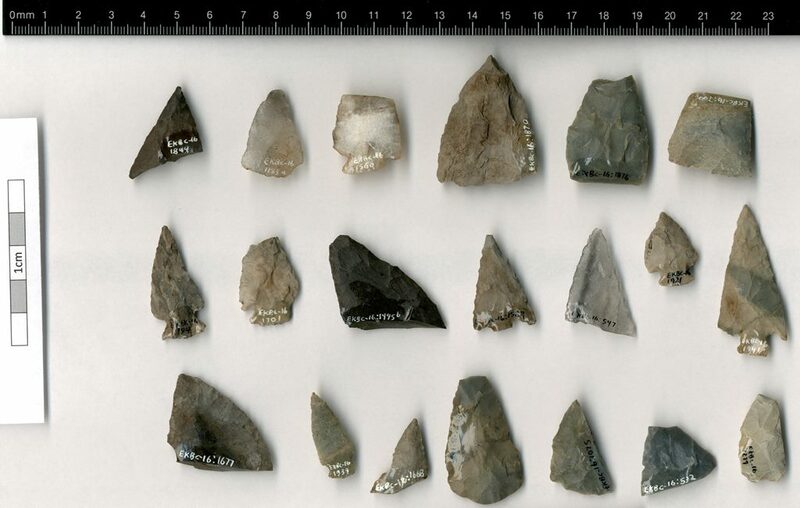 By far, most of the lithics from the site were from the late Recent Indian period which generally falls into the time frame of 1000 years ago to European contact. Typically, early Recent Indian period tool kits are defined as having larger side-notched bifaces and the late Recent Indian tool kits are defined as having small corner-notched bifaces which trend towards stemmed bifaces closer to European contact. This is a general rule of thumb and is by no means a hard fact. The lithics and ceramics from the site were in storage since shortly after their excavation in the 1980s. Last fall I was able to get photos of both the lithics and Native ceramics. Most archaeologists working in the province today have never had the chance to see these artifacts. As I said earlier, Native ceramics are rare in Newfoundland and Labrador so truthfully I can’t say much about the ceramics beyond what I said above; they were low fired and tempered with coarse grit and decorated with cord-wrapped paddle edge impressions. I am more comfortable discussing the lithics. One of the first things I noticed was that the collection includes a wide assortment of materials and I am pretty sure there is more than just Recent Indian material in the collection. This discussion comes with the caveat that it is difficult to say anything for certain about artifacts from just pictures. With this in mind, the 5th artifact from the top-left with its nice and even side notches, straight base and convex blade margins (possibly serrated) looks a little more Palaeoeskimo to me than Recent Indian, perhaps Groswater Palaeoeskimo. But the material is unlike something the Groswater typically use, it appears to be a coarse grain chert or quartz. With this is mind and the style the biface could be Intermediate Indian. 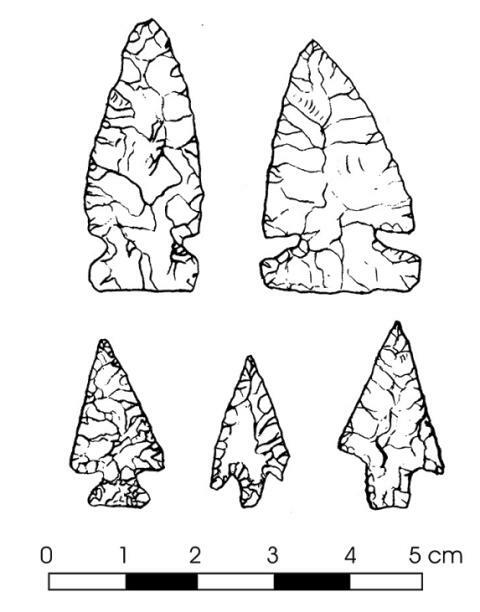 On page 117 of the Provincial Archaeology Office 2013 Archaeology Review (PDF) there is a very similar looking biface from an Intermediate Indian site. Photo 1 above also shows several diagnostic late Recent Indian projectile points such as the one in the centre of the photo (#740), or in the top row (#92), both of which are Ramah chert. 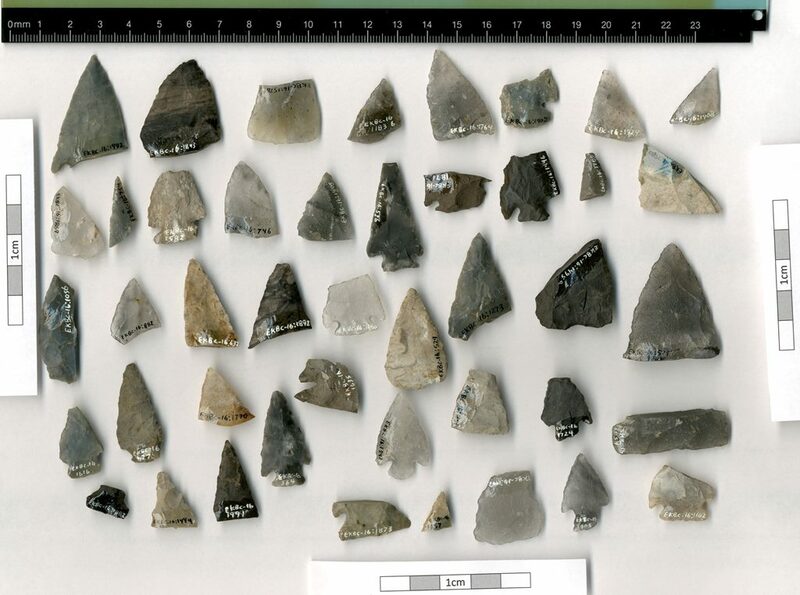 The four bifaces in the top right (#s22, 85, 61 and the large black one) are all diagnostic late Recent Indian projectile points. Of interest is the base on the two-tone grey notched biface, second from the top on the right. The basal tangs are very thin with a deep concavity in the base; the artifact on the bottom left seems to be a similar base. The thin concave base is also seen on the middle artifact top row of photo 2. These bases seem unusual for late Recent Indian. Perhaps this is an example of variability within the Recent Indian period or perhaps these are a different group altogether. Several of these artifacts (photo 1) appear to be made from Newfoundland chert. The grey and grey-tan mottled artifacts appear to be made from Port au Port chert while the brown and brown-grey mottled scrapers (right side) may be Cow Head chert. In this photo (2) one of the first things I noticed, beyond the thin concave based biface, was the side-notched biface on the right. The milk white colour appears to be an example of burned Ramah chert. 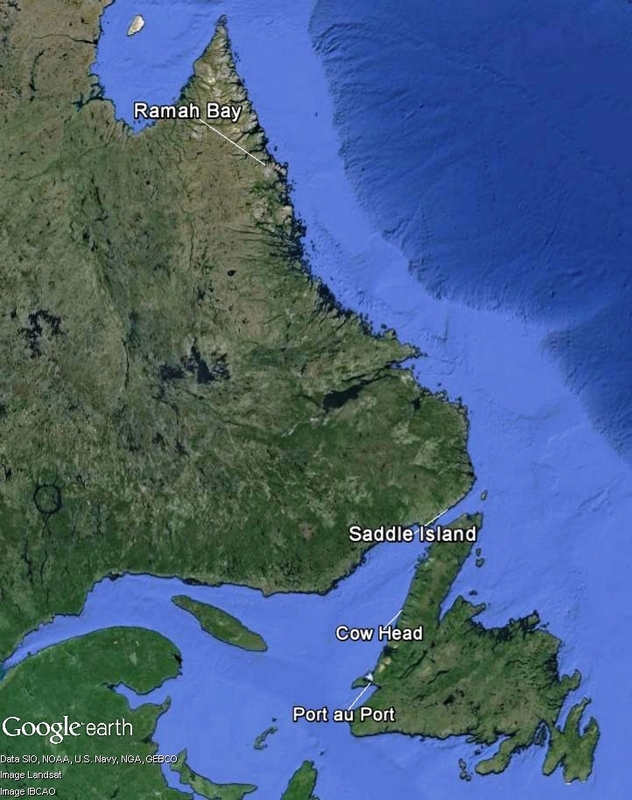 The two grey-tan bifaces may be Port au Port chert. This photo (3) seems to show an assortment of mostly corner-notched late Recent Indian bifaces. As is normal for this period these bifaces appear relatively small and were likely used to tip arrows. However, on the right side is a large base from a side-notched biface that looks more like an early Recent Indian spear tip. Once again there seems to be an assortment of cherts from the Island, Labrador and perhaps other sources. Most of the artifacts in this photo (4) appear not to be Recent Indian. The three quartzite bifaces, two on the right, one on the far left are more likely Archaic (although the site is likely too low for an Archaic occupation) or Intermediate Indian based on style and material. 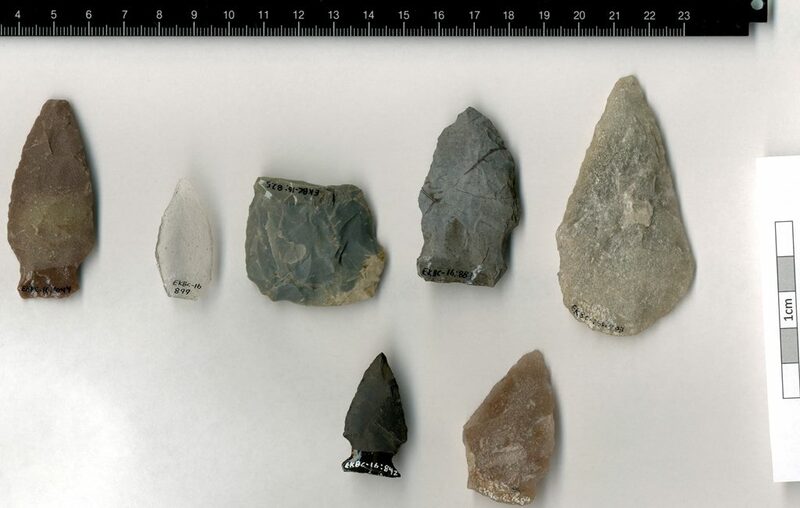 The clear Ramah chert biface second from the left appears to be an Archaic arrowhead, while the thick grey biface, second from the right, may be a Palaeoeskimo knife. This final photo (5) shows another assortment of mostly late Recent Indian bifaces and biface fragments. Once again several are made from Port au Port chert and Ramah chert, including the one in the top row, third from the right, which may be another example of burned Ramah chert. This site presents an interesting mix of cultures, artifacts and lithic materials. Given the number of hearths at the site and the potential number of cultures represented in just the lithics seen in the photos it seems very likely that the site was used repeatedly over thousands of years by different cultural groups. It is too bad the site is not better understood. 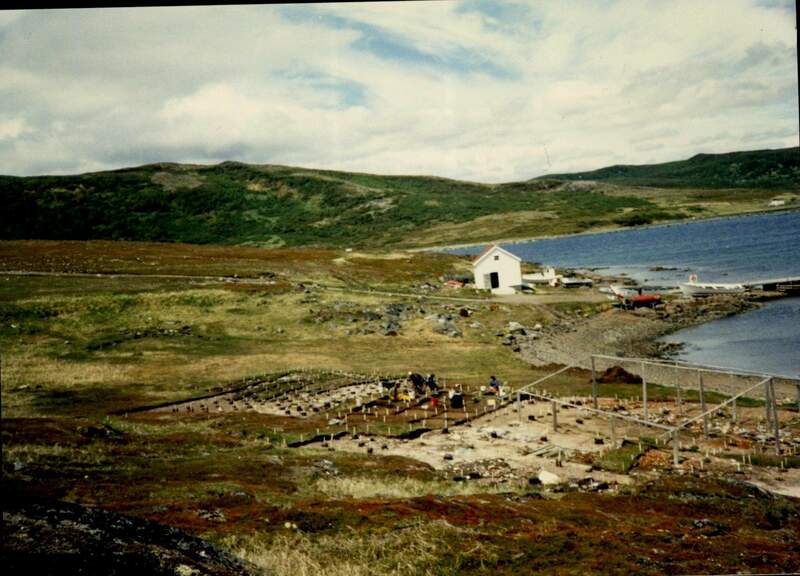 ROBBINS, Douglas 1989 Island Dwelling, Isolation, and Extinction- The Newfoundland Beothuks in Northeastern Prehistory and History PHD Proposal. TUCK, James 2005 Archaeology at Red Bay, Labrador- 1978-1992.